“Before Television” is a feature that shares the Courtenay and District Museum collection with readers while at the same time highlighting the ingenuity and creativity of people as they added beauty and personal style to items from their home and work life. This month’s item is a natty cigarette and make-up case from the 1920s featuring a needlepoint design. 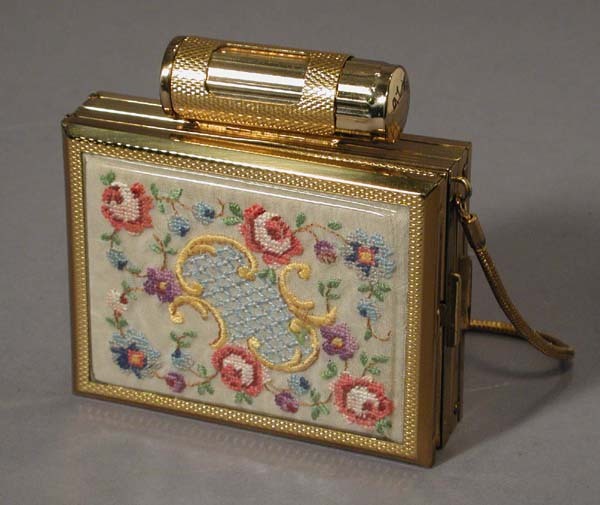 The case opens into several compartments: mirror, loose face powder, puff, and holder for seven cigarettes. With lipstick clamped firmly to the top, just grab this compact little number and you were ready to go. The museum gift shop is gearing up for spring break and summer visitors. Some new items that have already arrived are hoodies, mugs and totes with the up-dated museum logo. We also have a new range of brightly coloured cotton scarves, water bottles and travel mugs in stock. And expect to see a line of distinctly Canadian items in the near future – they make the perfect gifts for family and friends who live outside of the country. Remember: if you are a Museum Member you will receive a 15% discount on gift shop items (sorry not applicable on consignment items). 2013 marks the 100th Anniversary of St. Joseph’s Hospital and this January 19, 1928 Courtenay Free Press article gives a nod to their past. It is the Hospital Report for 1927 which contains some very interesting facts and figures in regards to finances and patient care. 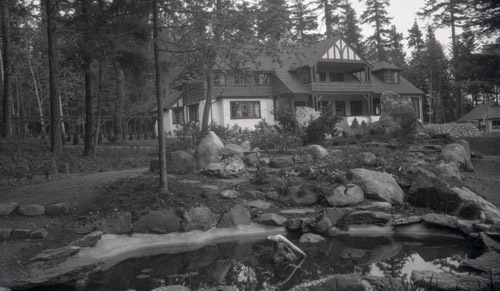 Take a look back at what must have been one of the loveliest homes in the Comox Valley, The Fort, which was built for Sir Ernest and Lady Petter in 1938-39. The building still stands today at 156 Manor Place and houses professional offices. It is part of the Town of Comox Heritage Walking Tour. The three images that follow are from the Sillence Collection held here at the museum. And (what luck!) 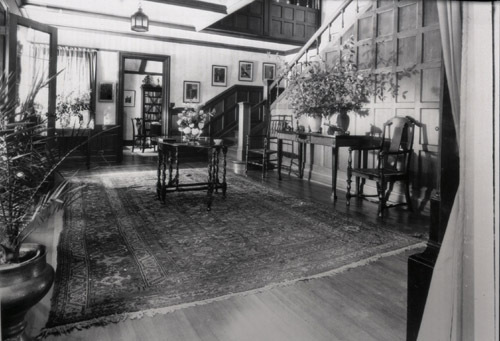 our archives file contained a wonderful description and details about the house’s interior and grounds from The Vancouver Sun of Tuesday, June 27, 1939. “Sir Ernest and Lady Petter have settled into their pleasant new home on the sea-front at Comox, arriving from England in May. Their decision to come to live on Vancouver Island was reached only after a reconnaissance of three years. They came out to see relatives at Comox three years ago and fell in love with the valley. Each succeeding visit confirmed the impression that Comox was a very pleasant place in which to live. 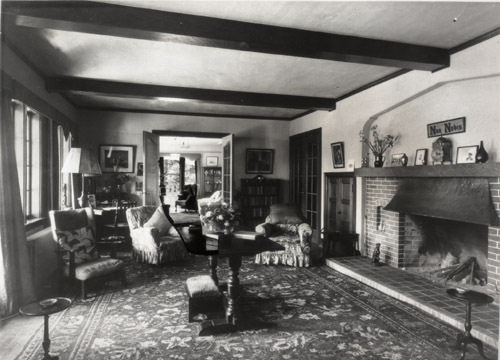 The house was commenced last June and was completed before Sir Ernest and Lady Petter arrived this spring. The site is on a cliff overlooking Comox Bay, with a superb view of Comox harbor, the Gulf of Georgia to the east, and the mountains of Beaufort Range on the west. The bluff was locally known as McCutcheon’s Point and it was once owned by Lady Currie who lived in the Comox Valley at one time. The house fronts the bluff with a screen of fine old oak and maple trees to protect it from the full force of the south-easter. Behind and between it and the road is a small park of conifers and maples through which winds the road to the house. The principal entrance to the house is on the north or land side through a Tudor arched oak-studded doorway into a tiled porch and this in turn gives access to the spacious oak paneled hall with its dignified oak staircase leading to the upper hall. The tiled cloak room, large lounge study and drawing room are reached from the entrance hall. In the entrance hall hangs a picture of H.M.S. “Lion” at the battle of Jutland. In the top corner of this painting is shown a seaplane built by the firm of which Sir Ernest Petter was head. The picture was presented to Sir Ernest when he was knighted in 1925 for his work as a commissioner of Wembley Industrial Exhibition. It and all the other furniture of the house came out from England and was in place when the owners arrived this spring. The lounge, with its beamed ceiling and large open fireplace with copper hood, opens on to a spacious tiled south verandah overlooking the bay, from which steps lead down to a broad flagged terrace. The drawing room with its coved, moulded ceiling has a large south bay with window seat and doorway leading to the rose garden. A service corridor running through the house from north to south connects the tiled north and south verandahs and gives access to the large dining room with coved ceiling, a flower room, kitchen, pantry and staff quarters. The upper-floor staircase hall leads into a wide corridor 40 feet long with pilasters and arches, giving access to five bedrooms. The owner’s spacious bedroom has a tiled open fireplace and French doors leading to a large south verandah. There are three roomy modern bathrooms with tiled floors. All bedrooms have spacious cupboards and dressing closets and built-in drawers. In the attic are maids’ bedrooms and storage space. A part basement accommodates the oil-fired, hot-water heating equipment with which the house is heated by radiators in the various rooms, automatically controlled. The laundry is also in the basement. All the floors of halls, corridors and principal living room are of white quarter-cut oak and the bedrooms of birch. All walls and ceilings throughout are decorated in a soft shade of beige. The house has a 105-foot frontage towards the bay by 55 feet in dept. The exterior is free English Tudor adapted to its Vancouver Island exterior. With its sweeping roof lines, half-timbered walls, gables and massive chimneys, it is already slipping naturally into its sylvan surroundings. The lower portions of the outside walls are off textured stucco, and the upper part of cedar shakes and half-timbering. The roof is of cedar shingles. All windows and French doors throughout the house have wide zinc glazing bars. A four-car garage has been erected as a separate unit. The rough plans for the house were drawn up by Sir Ernest Petter, who submitted them to Hubert Savage, A.R.I.B.A., architect of Victoria, who then completed the design and superintended construction.